Beloved as it was by critics and fans, Gilmore Girls was never known as a ratings blockbuster back when it first aired on the dearly departed WB network (and, for a season, the nascent CW). For most of its original 2000-2007 run, the show reached close to 5 million viewers each week — a decidedly modest number during a time when hits such as Friends attracted 25 million and even a flop like CBS’s short-lived The Eduction of Max Bickford could bring in 10 million. But it would also be a mistake to write off Amy Sherman-Palladino’s family dramedy as an Arrested Development–like cult classic being revived this week by Netflix in a bid to micro-target a small sliver of its subscriber base. Fact is, even if Gilmore was never a juggernaut overall, it was actually a sizable hit among early-2000s millennial women. And based upon a close examination of Nielsen ratings data, there’s ample evidence to suggest its fan base has grown exponentially in the decade since it left the air thanks to heavy exposure on the network formerly known as ABC Family. This combination of OG (original Gilmore) viewers and more recent converts means there’s a pretty good chance Gilmore Girls: A Year in the Life will break the Internet — or at least heavily tax Netflix’s servers — when it launches Friday. The first thing to keep in mind when trying to quantify the size of the 2016 Gilmore fan base is that for a good chunk of its existence on the WB, it was actually a pretty big show by the standards the network used to define success. Sure, the 4 to 5 million viewer tally generated by the series was small compared to the big hits of the day. But keep in mind, the WB was a so-called “mini”-network: Launched in 1995, it was broadcast across the country on a network of smaller TV stations without the reach — or marketing resources — of more established broadcasters such as ABC or even Fox. And while WB stalwarts such as 7th Heaven and Dawson’s Creek had bigger, broader audience bases — particularly at the peak of their respective popularity — Gilmore was far more effective at reaching women under 35, the exact demographic the WB was targeting. Indeed, researchers at Warner Bros. TV, the studio behind Gilmore, tell Vulture the show actually ranks as the second most-popular WB series ever among young female viewers. (Only the family-friendly and teen-targeted 7th Heaven out-rated it among that demo. Hard to imagine now, but there were a lot of young women obsessed with Barry Watson back in the day.) Gilmore was so popular among young women, it wasn’t unusual for the show to compete for first or second place in its Tuesday night time slot, stunning given the WB’s relatively small overall footprint. What’s also impressive about Gilmore’s original WB run (and its final season on the CW, the network which emerged from the ashes of the WB and rival UPN) is how relatively steady its viewership remained during its seven seasons. The series struggled during its freshman year, averaging 3.6 million viewers on Thursday nights, where it had the misfortune of airing opposite Friends at a time when DVRs weren’t yet a thing. But when WB execs wisely relocated Gilmore to the much less competitive Tuesday night, ratings surged roughly 30 percent, pushing the show over 5 million viewers. It stayed in the 4.5-5 million range for all but one of its remaining years on the WB, dipping just a tad to 4 million viewers in season four, when Fox’s red-hot American Idol landed on Tuesdays. Only when Gilmore shifted over to the nascent CW did ratings take a noticeable dive — but even then, its final season average of 3.7 million viewers edged out its season-one numbers. It’s very rare for any TV show to end such a long run with more viewers than when it started. That Gilmore did so is a testament to the loyalty it inspired among its fans. Like any successful TV show, Gilmore didn’t simply disappear as a cultural force once it wrapped production in 2007. Cable’s Freeform (then known as ABC Family), which had started airing reruns of the show in 2004, instead became the new TV home for the goings-on in Stars Hollow. ABC Family never made Gilmore a focal point of its lineup the way some cable networks do with big broadcast acquisitions (think TNT’s obsession with Law & Order or TBS’s reliance on The Big Bang Theory). The show was never a regular prime-time presence, airing instead mostly during daytime hours. But much as it was for the WB, Gilmore has been a steady, solid performer for Freeform/ABC Family over the past dozen years, almost always ranking as a top-five basic-cable show among women under 35 in whatever time slot the network scheduled it. Of course, ABC Family/Freeform is targeted at that exact female demo and so most of its shows, original or syndicated, end up in at least the top ten with young women. But Gilmore is also a serialized comedy-drama that premiered when Bill Clinton was still president. For it to do so well all these years later, opposite all sorts of female-targeted daytime competition, is an impressive accomplishment. Also impressive: Gilmore is now luring audience on two different cable networks. In addition to Freeform, family-centric cable network UP began airing the show a year ago, expanding the Girls’ potential reach even further. And despite its age and long-time association with Freeform, Gilmore immediately became a signature series for UP: During its first season, it was the No. 1 show on the network among women under 50, beating even the network’s original drama Heartland. The network hasn’t been shy about using Gilmore on its air, either, airing the series a whopping 1,100 times over the course of the year. Per Nielsen, those runs were watched by a combined audience of roughly 11 million viewers. Similarly, Freeform’s far fewer plays of Gilmore — the Disney-owned network aired it around 400 times last season — also drew a collective audience of 11 million. Translation: A series that in 2007 ended its run with a weekly audience of under 4 million viewers was sampled last year by three to five times as many viewers. (It’s hard to nail down precisely how big this 2016 audience is since it’s possible some, or even many, of the 11 million UP Gilmore viewers overlap with the 11 million Freeform fans of the show). To be sure, the daily audience for Gilmore reruns is still pretty tiny. Most episodes of Gilmore on UP brought in just under 100,000 viewers last season; the Freeform plays averaged 120,000. While viewership on some days can spike dramatically — an episode Monday on Freeform averaged almost 200,000 viewers — nobody is going to confuse Gilmore with stalwart syndicated ratings-grabbers such as Friends or the aforementioned Law & Order. Still, not that many non-procedural, hour-long shows from the early part of the century — particularly those from a small network such as WB — are still even airing regularly on one cable network, let alone two. For example, Dawson’s Creek, long a regular on ABC Family, has vanished from daily syndication. And good luck finding ABC’s long-running Brothers & Sisters on TV, even though the Sally Field–led family soap drew twice as many viewers as Gilmore during its original run and signed off just five years ago. Some of Gilmore’s continued viewing is no doubt nostalgia-driven, with fans who caught the show when it first aired poking their heads back in to relive favorite moments. But it’s also not much of a stretch to imagine that, over the past decade, the series has recruited a whole new cadre of Rory and Lorelai loyalists thanks to its continued presence on TV (and, as of this fall, on Netflix). Much the way Friends has found a whole new following among the teens and twentysomethings of 2016, it’s not a stretch to imagine young women (and men!) who tuned in to the WB every Tuesday at 8 when they were in their 20s now revisiting the show with their middle-school-aged offspring. Because Netflix doesn’t release viewership stats, we’ll likely never know exactly how many of these folks flock to A Year in the Life. 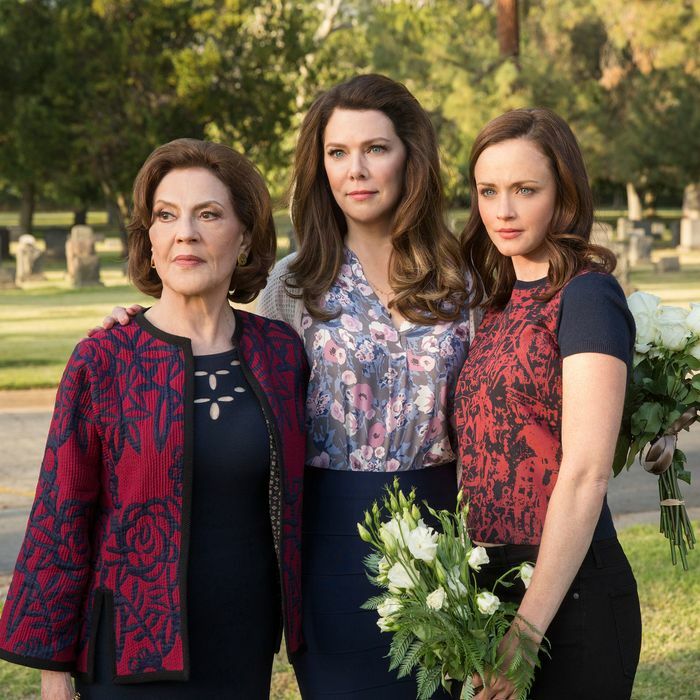 But given how the show performed on the WB and during its syndicated afterlife, it seems a safe bet that wherever Sherman-Palladino and her Gilmore gang lead, millions will follow.